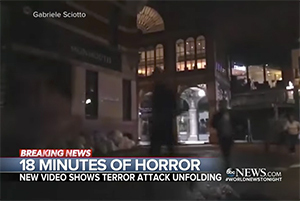 In late May, the world was once again struck by the evils of radical Islamic terror. Seven innocent lives were lost and countless more injured in a type of attack that is becoming all too common. In an increasingly dark and violent world, it can be difficult to find God. Where was He when three men decided to rampage through the streets of London? Where was He when innocent people died? And where was He when people cried out for help? All around the world, people are asking these questions, longing to make sense of the chaos that surrounds them. As Christians, it is our responsibility to be ready to answer these questions, because we must “always be prepared to give an answer to everyone who asks [us] to give the reason for the hope that [we] have” (1 Peter 3:15). We are not defeated by the darkness, and we must fulfill our calling as the salt and light of the world. Yet, every time we doubt the sovereignty of God, and every time we allow the terrorists to strike fear into our hearts, we let them win. However, it is important for Christians to acknowledge these questions that can be difficult to answer for those who do not believe in Jesus Christ. While the world around us continually rejects the truth, we must live out this one fact: God is sovereign. This is our comfort and our joy as we face events such as the terrorist attack in London. This is also the answer to the question, “Why?” It isn’t an answer that the world likes, and it isn’t an answer that the world accepts, but it is an answer that allows us to trust that God is in control — no matter what. Jesus reminded His disciples that, “In this world you will have trouble” (John 16:33). But, after this warning, He offered a reminder that is extremely poignant for today: “Take heart! I have overcome the world.” For the sake of those who lost their lives, don’t let the terrorists win. We must carry on with our heads held high. One day Jesus will return in victory, and all will be made new. This promise is our hope when the world turns upside down. Kyle Permann is the 2017 Antonin Scalia Legal Fellow for Concerned Women for America.